An individual income tax (IIT) is a tax levied on all wage earners within a given jurisdiction. With the exception of Brunei and Cambodia, the former having no IIT in place and the latter a fixed 20 percent rate, the nations of ASEAN, China and India all employ a progressive IIT system wherein an individual is taxed according to how much they earn. This results in individuals with a higher salary being taxed at a greater rate than those with a lower one. Asia’s IIT rates have for the most part been experiencing a downward turn in recent years. 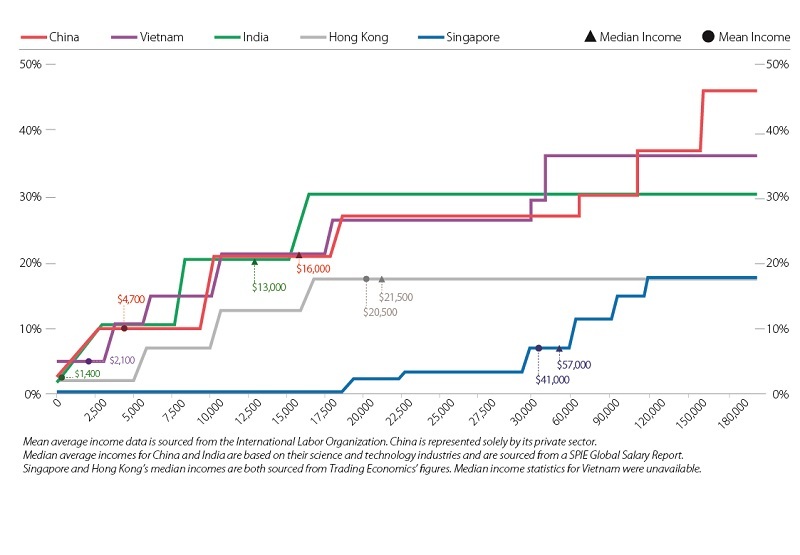 Hong Kong, Vietnam, Malaysia and Indonesia, for instance, have all marginally lowered their income tax since the turn of the century. Nevertheless, there still exists a sizeable gap between the region’s highest and lowest IIT rates. Below, we provide a visual representation of the differences in IIT between five key jurisdictions in Asia: China, Hong Kong, India, Singapore, and Vietnam. This chart shows what percentage an individual stands to be taxed at according to their income. For foreign investors with even a passing understanding of Asia’s income tax rates, the results of this graph will be of little surprise. Both China and India have taxed their highest earners by 45 and 30 percent respectively for a number of years, while Vietnam’s 35 percent rate has been in place since 2009. Conversely, Hong Kong and Singapore have long maintained comparatively low maximum IIT rates of 17 and 20 percent. What these rates fail to take into account, however, is the average income levels of each of these jurisdictions. While it is true that employees with higher salaries stand to be taxed more in countries such as China and Vietnam, the low wage levels of these countries ensures that the majority do not qualify for these rates. India does not tax individuals that earn less than US$3000 per annum, and with a mean average wage of just US$1400, the typical Indian worker will therefore not be taxed on their income at all. China and Vietnam maintain a minimum three and five percent income tax respectively, with both increasing to 10 percent once an individual’s income exceeds US$3000. In contrast, Hong Kong’s maximum IIT rate of 17 percent applies to individuals earning US$15,000. With an average annual income of US$20,500, this means that the majority of wage earners in China’s Special Administrative Region are taxed at its maximum amount. However, it should be noted that while Hong Kong’s IIT rate is capped at 17 percent, tax there cannot exceed the net assessable income of 15 percent, effectively making 15 percent its highest possible income tax rate. 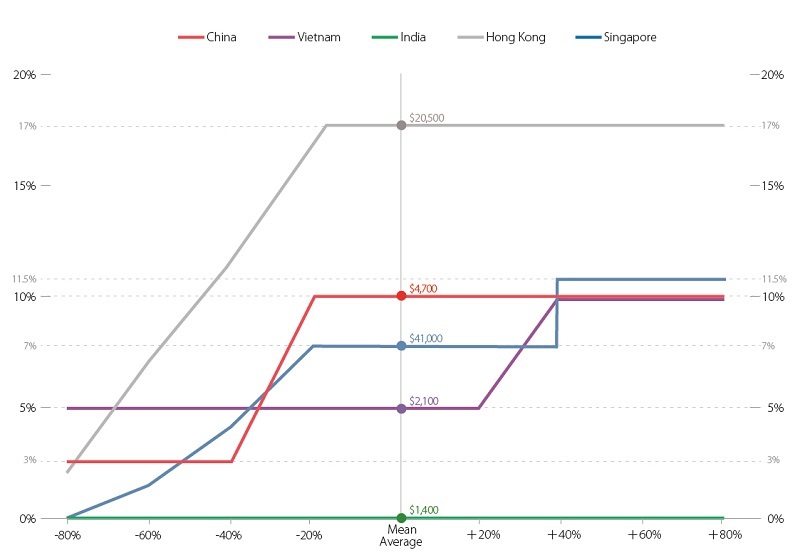 Here, we provide a visual representation of Asia’s income tax rates according to the average annual income of each. We also show how the amount taxed is affected by increases and decreases of up to 80 percent. 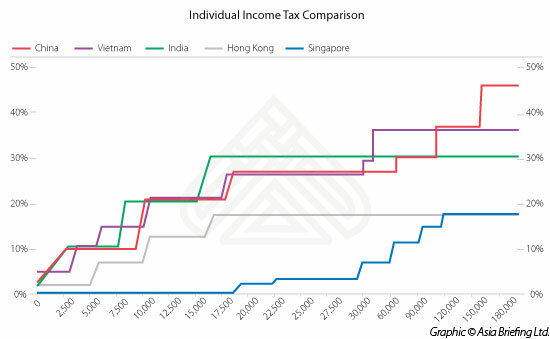 From this, Singapore appears to have a more favorable income tax regime than other jurisdictions in Asia. Its high average annual income of US$41,000 is only taxed at a rate of 7 percent, and doesn’t increase until an individual’s income exceeds US$60,000 per annum. It is important to remember that these graphs are based upon estimates and exchange rates at the time of writing, and therefore should not be used to make any meaningful IIT calculations. For current, professional tax advice relating to a specific Asian country, please contact the tax experts at Dezan Shira & Associates at tax@dezshira.com. In this issue of Asia Briefing, we explain how and why the Asian sourcing market is changing, compare wage overheads, and look at where certain types of products are being manufactured and exported. We discuss the impact of ASEAN’s Free Trade Agreements with China and India, and highlight the options available for establishing a sourcing model in three locations: Vietnam, China, and India. Finally, we examines the differences in quality control in each of these markets.